We’ve talked about measurements and the importance of hiring a cleaning company that has its legal ducks in a row. 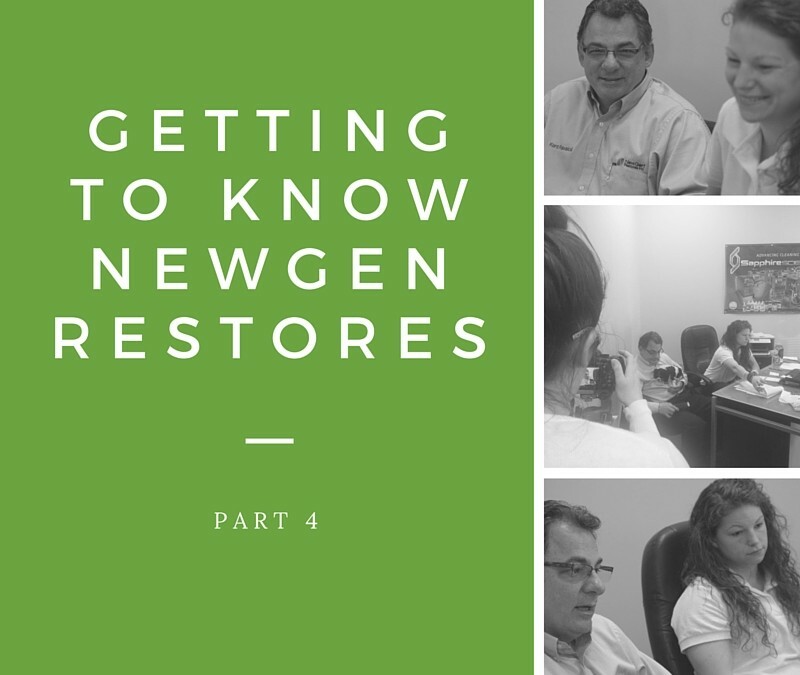 We’ve discussed our work schedule and how NewGen Restores can accommodate both residential and commercial clients with minimum fuss. We’ve also given you some tips on how to best prepare your space for cleaning; and we laid to rest any concerns you might have had about the safety of the process or of any products we use. And now, in the fourth and final installment of our interview with Kent and Liz Ravaioli, it’s time to delve into more detail about how long a cleaning job will normally take. We’ll also discuss how NewGen Restores quotes for a job. Are you ready for the lowdown? Read on. How Long Does A Cleaning Job Take, On Average? Well, it really depends on what the particular job involves. Typically, cleaning 3 carpeted rooms can take anywhere from 45 minutes to an hour and a half. The client would then need to wait for the carpet to dry. Of course, as we explained already, there are a lot of factors that can affect drying time. However, this doesn’t mean you would have to steer clear of the room. You can walk on the carpet immediately. The only risk you face is getting your socks wet, which is why we leave booties behind for you to wear. How About Hardwood Floor Refinishing? Hardwood floor refinishing can be more time consuming than cleaning carpeting, because there is going to be a lot more work involved. There are different levels of refinishing. A renewing process, which we would typically do if the hardwood’s stain is still in good condition, is usually a two day process. This is because we apply two layers of polyurethane coat on the floor. Obviously, we have to wait for the first layer to dry before we can apply the second one. That said, you’d be able to walk on the floor with your socks on about five to six hours after we apply the first coat (not with your shoes on, though). It’s also perfectly safe to be around, because we use water-based polyurethane. This doesn’t emit any harmful fumes. What About Tile And Grout Cleaning? Cleaning the tile and grout in a typical bathroom would normally take about an hour and a half. The main challenge here is that grouting is porous, so it tends to absorb whatever it makes contact with. This makes cleaning a very labor intensive job. We do use industrial grade machines to clean tiles and grouting. However, despite the machines, we find that good old-fashioned elbow grease does the most thorough job. We actually scrub tiles by hand, and only then bring in the machines. We also seal the tile up, which protects it from further contamination and keeps it looking clean for longer. For commercial spaces, we price by square foot; whereas we price per room for residential spaces. Size isn’t the only thing we take into consideration when we quote for a job, however. Firstly, we need to keep our overheads in mind. We have to factor in the cost of equipment, insurance, and wages for our technicians. Cleaning agents in particular can be extremely expensive. Secondly, we take into consideration the time it will take us to do the job. Big open spaces will often work out cheaper because they are less time consuming to clean. Moving furniture, on the other hand, increases the cost, because it makes the job more time consuming. Finally, we’ll also consider the condition of the area we have to clean. Pet stains and filtration staining (the black staining around the edges of a carpet), will add to the cost because the cleaning process is harder and more time intensive. This means that, the more maintenance you do, the cheaper professional cleaning will be.